Nanotech: Are we losing the battle? 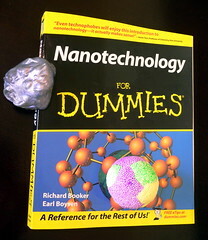 Over the past decade, nanotechnology has enjoyed a lot of attention from the research and industry communities. That seems to be changing. According to the latest Lux Research Report: “Nanomaterials State of the Market Q1 2009: Cleantech’s Dollar Investments, Penny Returns”, nanotechnology is becoming mainstream. The industry will slowly stop using the term “nano” as a marketing tool, as it will be part of most products on the market. More, the “Nanophobia” in both in the industry’s and in consumers’ minds, resulting from the recent focus on nano-material Environmental Health and Safety (EHS) has convinced manufacturers that it might not be worth taking the chance. As for the investing environment, there are still good investing opportunities, if you know where to look. According to Lux Research, the nano-intermediates (coatings, memory chips, and catalysts) are the way to go if you’re looking for a nanotech investment. The report predicts an increase in aggregate net profit margins from nine per cent in 2007 to 15% in 2015. The winners seem to be nano-intermediates for electronics and energy (especially energy storage), in the short term, and for health care in the long term. Even though Cleantech is all the hype right now, investment in solar and other green technologies will have poor returns on investment. As for the nanotech research funding, things seems to be going in the right direction — at least in US. Both government spending and corporate funding for research has been increasing over the past few years, reaching $18.2B in 2008. In 2009, the focus of the government-funded research is expected to change from discovery to environmental, health and safety (EHS) risk research. One of the interesting but not surprising conclusions from this report is that Canada is losing in the competitiveness game, being classified as a “Minor League” country, in the same quadrant with countries like India, Australia and Russia. Even worse, we are the only country to report major decrease in technology development strength (the ability to commercialize innovation) in this quadrant, in 2008. It’s not the lack of investment or the lack of scientists: Canada fared relatively well on both these criteria. It’s the lack of successful transition from research to market. Only very few Canadian companies are considered competitive players in this field, companies like CG2 Nanocoating, Integran Technologies and Nova-Plasma. So my questions are: If we have the scientists and we have the money, why is it so difficult to take advantage of it? And knowing that nanotechnology is an enabling technology that impacts ALL industries, don’t we risk losing our future competitiveness across the board if we fail on this front?